For most drivers, a long drive can make them weary and tired. It is not surprising that a lot of them are more than willing to spend for a beefed up car sound system. And it all begins with the car subwoofer. 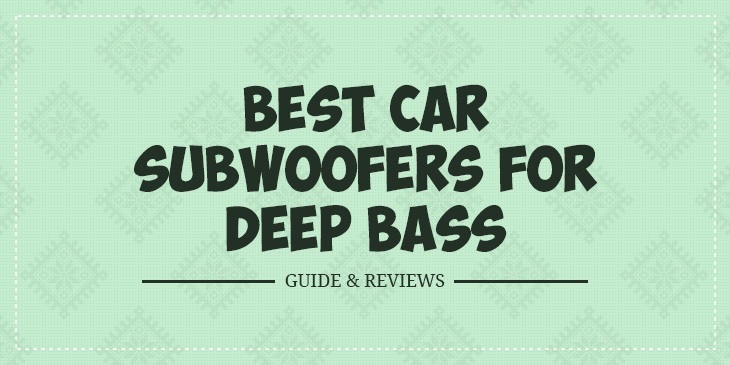 With the many subs in the market advertised to be the best car subwoofers for deep bass, you won’t have a dearth of choices as far as subwoofers are concerned. You can choose subwoofers that would fit in the space in your car. If you are concerned about the sub taking up precious passenger space in your ride, then you could go for a shallow mount subwoofer. But if that’s not much a concern, there are also lots of subwoofers that can be placed on the backseat so you’ll be able to hear every beat. If you’re looking for portable speakers, then this is one model you should consider getting. You can place it in the backseat, under the seat, or even on the dashboard. Once you’re done driving, you can carry and bring it to your room or office. It’s a very convenient audio device to have around. I also like the design of the speakers. It has an aluminum case and sturdy body. You can place it in any location without worrying about it easily getting damaged, or its performance affected by the elements. Aside from being very portable, you will love this subwoofer because of its good sound quality. It has 2x 10watt speakers and 2x passive radiators. You will enjoy full range stereo sound when you have this sub around. Bass remains clear and clean even when you turn up the volume. You’ll definitely love it in the car, or while partying or working out. According to most reviewers on Amazon.com, Boom X has the same sound quality as other more popular brands like JBL and Sony. But what’s more impressive is that the price is nearly half of the products from those brands. Because it is a Bluetooth speaker, this sub also lets you take calls anytime. It can connect to a media device that is up to 33 feet away. A major downside, though, is that you will have to recharge it every now and then. Its battery can only last for 8 hours. But if you don’t like the hassle of recharging your sub every now and then, you can settle for a more traditional, built-in sub like this one from Pyramid. It has a power of 1,000 watts and built-in neon accent lighting that can make your ride the envy of your friends and colleagues. With four tuned ports, you can be assured of deep and clean bass from this sub. These subs have silver polypropylene cons that are rigid and can withstand heat. It can withstand extreme temperatures that are common to automobile applications. Be warned, though, that it could take up some space in your car. Most reviewers on Amazon.com say they have put theirs at the trunk of their cars. But none of them are apparently regretting their decision to get this, because they say it delivers in terms of performance. They also like that they can back their car up in the driveway, pop the trunk open, and then play music. The light coming from the speakers could jumpstart a backyard party, so to speak. The two subs are mounted in a sealed chamber, with a ported chamber that delivers the sound into your vehicle. This results to a narrow frequency range with lots of volume and compromising efficiency. Many reviewers say they are satisfied with the low and accurate bass that this sub produces. This is another Bluetooth speaker that you can bring in to your car and make its old audio system sound better than ever. Like the other Bluetooth speaker, this is very portable that you can use it in the car, in your room, office, or even in the beach. It can connect to devices that are up to 33 feet away from it. And just like any other Bluetooth speaker, it would allow you to take calls from your phone. If you’re not exactly thrilled at the eight hour capacity of the other Bluetooth speaker, then you should get this one from Coulax. It can last up to 10 hours on a single charge thanks to its built in 1000mAh battery. While there’s no AC adapter included in the product package, you can charge the battery using the charging cable you typically use in your smartphone. I’m not certain if this one has a better bass than the other Bluetooth speaker, but what I’m sure is that the Coulax wireless portable speaker has enough bass to satisfy you. It hits pretty hard for a portable speaker. Moreover, I love that it connects very quickly to any mobile device. It’s safe to assume that you won’t be spending a minute or so connecting this to your smartphone or tablet. Finally, this speaker is so small that it will fit in your hand. You can put this in your camping bag once you get out of your car. This is one of the best Bluetooth speakers that you can use in your ride. Lanzar may not ring a bell in the same way that Pioneer or JBL does but if we are to believe reviewers on Amazon.com, this subwoofer can make your car audio system sound a lot better. Most reviewers on Amazon.com are raving about how this sub pounds their vehicles. They say the sound produced by the subs is second to none. Most of them have this sub boxed in a ported enclosure, and placed behind the back seats. When paired with an appropriate amplifier, this subwoofer produces clean and clear bass. Many owners also point out that with the 10 inch, black non-pressed paper cone, the subs can generate rich and accurate deep bass. Some even compare the sound to those produced by high end audio setups. But Lanzar isn’t a high-end brand, so you can understand why a lot of the owners of this sub are raving about its superior bass production and affordable price. However, there are some reviews from unsatisfied customers on Amazon.com indicating that its durability is questionable. One consumer said both speakers blew up in less than 2 months. You may have to be wary of this if you are considering getting this sub. If you ask me, this is the best car subwoofer that you can get if you’re looking to add deep bass to your automobile’s sound system. The Bluetooth speakers are nice, but I’m wary of the fact that you have to charge it every now and then. The Pyramid and Lanzar speakers are both good choices but let’s face it—those are made by lesser known brands. This sub, on the other hand, comes from one of the best brands out there. Ask any driver who’s had the chance to have a Rockford Fosgate speaker or sub installed in his ride, and he’ll likely say a lot of positive things about the brand. This subwoofer has a rigid, anodized aluminum cone that can retain its shape through heavy play. It also stays light and responsive. Rockford Fosgate also has attached an oversized rubber surround to the said cone, increasing the cone area by around 25 percent. This, in turn, allows the sub to push more air for even deeper bass. There are dual 2-ohm voice coils that give you a lot of versatility in wiring this sub.There aren’t a lot of complaints on this subwoofer on Amazon.com. There are a few reviewers who say that it can get hot on some songs. Others think it’s a bit overpriced. But I can assure you this--- it is one subwoofer that can add deep bass to your car sound system. There you have it—five of the best car subwoofers for deep bass that you can add to improve your car audio system. I can say that this list is diverse—you have traditional built-in subs, and Bluetooth speakers. So it is really up to you to choose a speaker that suits your car better. If you are concerned about the subs taking up a lot of space in your car then you might want to go with a Bluetooth speaker. However, you would have to charge the speakers every now and then. On the other hand the traditional wired speakers aren’t portable but these subs are ready to blast your ears anytime.